A federal judge has ruled that the State Department must do more to track down emails then-Secretary of State Hilary Clinton wrote about the Benghazi attack that killed four Americans, including U.S. Ambassador to Libya, in 2012. The ruling, handed down by U.S. District Court Judge Amit Mehta, was a partial win for Judicial Watch—who have previously taken the State Department to court to get documents related to the attack, as well as other Clinton emails. The assault on the U.S. diplomatic compound on Sept. 11, 2012 and its CIA Annex the next day resulted in a public relations controversy for Clinton and National Security Advisor Susan Rice after evidence challenged their initial claims that the attack was not premeditated, but a spontaneous reaction to an anti-Muslim video. Using Freedom of Information Act (FOIA) requests, Judicial Watch had already successfully compelled the State department turn over email messages it requested Clinton turn over in 2014 after officials realized she had used a personal email account while she was State Secretary. Clinton turned over approximately 30,000 emails discussing State business, including the Benghazi attack. Judge Mehta noted in his ruling that the State Department also searched tens of thousands of personal account emails that three former top aides to Clinton—Huma Abedin, Cheryl Mills, and Jake Sullivan—had turned over to the agency, as well as emails the FBI collected during its investigation of Clinton’s private email account and the server she kept in her home. “In total, State provided 348 documents to Plaintiff, producing 125 in full and 223 in part,” notes the ruling. Those emails did not satisfy Judicial Watch, however, who filed a suit seeking summary judgement on whether the State Department should have also looked at official State email accounts from top Clinton aides for messages discussing the attack. Mehta agreed, finding that the State department had only searched emails originating from outside sources. “It has not, however, searched the one records system over which it has always had control and that is almost certain to contain some responsive records: the state.gov e-mail server,” Mehta wrote. Mehta said that concern “overstates the consequence of the court’s ruling” given the unique circumstances involved, namely the widespread use of private emails and a personal email server. 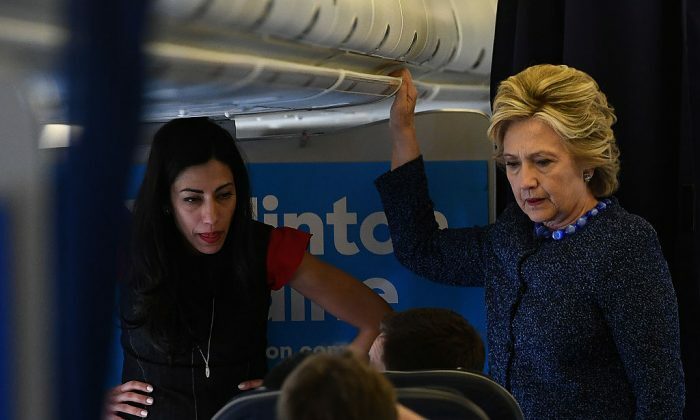 Judicial Watch had also asked the State Department to search e-mails that the FBI discovered in the fall of 2016 during its investigation of Abedin’s husband, Anthony Weiner, over an online relationship with an underage girl. Mehta deferred ruling on that second claim because the State Department already agreed to search them in another case in which the results are pending.